June 5, 2011 January 24, 2018 P.O.P. This past weekend, I’ve been fortunate to have the opportunity to visit Joplin, MO and volunteer with the recovery efforts in the aftermath of the recent tornado. It’s a daunting, sobering task that can’t help but make you pause to reflect on a number of things. Here are just a few thoughts that paraded through my mind while picking up debris in the June swelter. Sometimes media gets it right. It’s no secret that we live in an age of media exaggeration and sensationalism. (That’s one of the reasons for the existence of this blog.) As I came into Joplin, it appeared they’d done it again. Seeing initially the part of town that was little affected, I noted only a few trees down and some spotty structural damage to houses, and I figured the TV cameras had just zoomed in on a few buildings that got hit exceptionally hard. And then came the reality: miles and miles of total jaw-dropping, gut-wrenching, mind-numbing devastation. The media actually may have understated the case this time. Despite what you hear about people being greedy, selfish and cutthroat, most of us jump at the opportunity to help out someone in need. Sometimes it takes a disaster to jolt people out of their ruts and make them realize that their help is needed. But we have an innate drive to be of service – ALL of us, regardless of age, race or creed. Disaster relief is a conspicuous manifestation of the bias toward religion that permeates our society. Most of the people you see – no, strike that – most of the people that you NOTICE reporting to volunteer are affiliated with a church group. They arrive in vans, wearing custom made T-shirts advertising their congregations from all over the country. Hey, it’s great to see them, from southern fundamentalists to Middle Eastern Muslims. Joplin needs all the help it can get; even the Scientologists are a welcome sight. What’s annoying is that it’s often difficult to find an outlet for volunteering without going through a religious group. The official spin is that churches have cornered the market when it comes to charity. And this perception has contributed to the belief that one must be religious in order to be moral, in order to be a good person. The truth is that secularists are just as caring and helpful as anyone else (see above); they are just not as massively organized nor as publicly visible as the religionists. Religion is, for better and for worse, a highly conspicuous thread running through American society, especially in this part of the country – they don’t call it The Bible Belt for nothing. Just try having a ten-minute conversation with someone about their social life without having them mention their church. The work these folks do for charity is an extension of everything else they do; but contrary to what many believe, it is religious people doing the good deeds, not religion itself. Sorry, but the reality is that such tragedies often strike (think Joplin and Katrina, for instance) in areas having a high concentration of believers. Just around the corner from the houses where I was picking up the sad traces of some family’s home and life were the sparse ruins of a church building, with only a couple of pews remaining, and its hymnals scattered to the winds. In case you haven’t noticed, there has been an increase in storms of this type in recent years. And it’s likely to get worse. Because it’s quite probable that global warming is contributing to it. Of course, the Cult of Denialism will poo-poo this, and find some other explanation. (See above.) They believe that global warming would be linear and consistent, and therefore having a cold day now and then totally discredits the exhaustive research of climate scientists. What they don’t realize is that global warming produces extremes of many kinds, including cold weather and winds. But don’t worry, the extreme heat is still there too: while I was cleaning up debris, the thermometer reportedly hit a new record for the date. 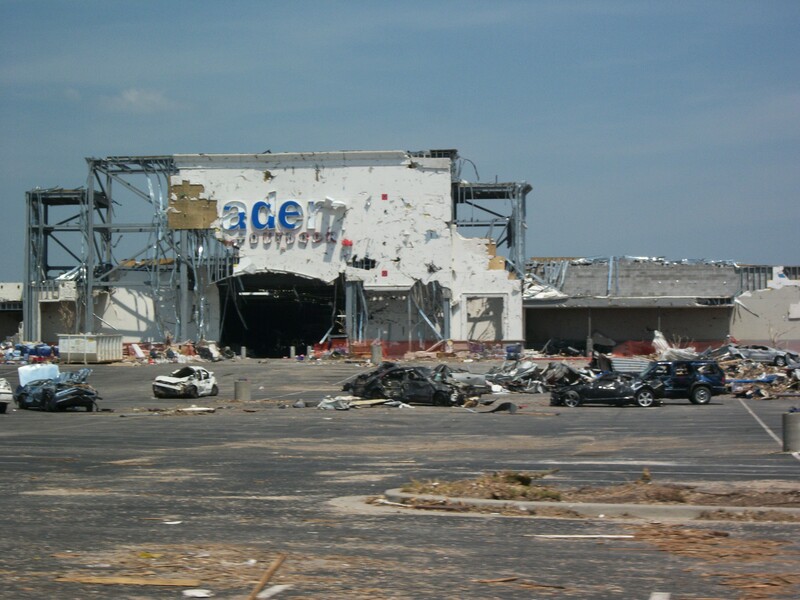 Finally, note that Joplin still needs a lot of help, and will continue to need a lot of help for a long time. You can contribute hours, money or goods – even if you’re not religious. Honestly. This is a great commentary on the condition of religious delusional thinking today. Although I don’t believe all religious people are self-seeking, hypocritical dogmatists, there are enough that fit this description to warrant some serious thoughts about what is really happening in their minds. Extremes found in fundamentalist faiths and cult-like groups are easily seen as reprehensible by most people. However, when members of various faiths and denominations, latch onto the idea that they alone have been chosen by God to enlighten the rest of us, this effectively justifies them to ignore reason, in whatever way, and for whatever theological justifications, they want. Sadly, many Biblical scriptures provide them with more than enough subjective gratification to persuade them that they are really being persecuted for being true believers. What they ignore, is that often they are disliked merely because of their refusal to think critically about their own ideas or faith. It is not that most people hate Christ, or totally deny any value in religion, it is just that (as in 1984) people become frustrated whenever they hold up three fingers and are rebuffed for not recognizing them as being four. Perhaps logic is not everything, but it is an important tool for rational minds, who honestly want to examine exactly what is true and what is not. And, most of us are reasonable enough to know that we can’t throw knowledge out the window whenever one of our own theological beliefs is threatened by it. A prime example is the massive evidence corroborating the existence of physical evolution in nature which also indicates that our world is billions of year old, not merely under 10,000. Because we know how dating techniques–carbon dating being just a very small and primitive example among dozens of more accurate dating techniques–we know that the estimates we obtain are all pointing to an extremely long age for the Earth. Yet those of us who accept the evidence of our senses seem to be pitied for our resistance to faith, and our naivety about the devil’s effort to dissuade us from the truth. And, whenever we point out the absurdity of denying this massive physical evidence, we are considered sinners who just don’t want to see the truth. But what fundamentalist choose to see as the truth is really whatever THEY want to believe–obviously not the other way around. If I see a tree in the yard and say, “this tree has been around since my childhood ” (now being 90 years old) and that therefore the tree must also be at least 90 years old,” certain religious people could actually berate us for not seen that it was planted yesterday! The real truth is that they are the ones being false, not us! But when we protest, we are pigeonholed by their circular and denying theologies! unfortunately, believing that our frustration or anger when we try to point out physical reality, comes from ignorance, only enforces their belief that we represent one more way that they are being “persecuted for their righteousness”–a self-perpetuating myth like this, explains to them why “sinners” or “secular” people remain outside of “Gods” grace and refuse to heed the words of they, the chosen ones. Yes, religious truth becomes suspect whenever it is used merely to enforce its own forgone conclusions—they see what they want to see, and hear what they want to hear–but unlike scientists who are willing to change opinions with the introduction of new empirical evidence–many religious people refuse to recognize threatening new knowledge, and only cling to their personal preferences without ever agreeing to concede on any obvious points. The more others protest and the more irritated they become over such religious dogma, “true believers” are even more convinced that it is all an effort to persecute the truth which only the “chosen ones” acknowledge. The danger in this kind of absolute intellectual denial is obviously that truth becomes irrelevant, and only beliefs or faith become all encompassing and real. The fundamentalist person lives in a philosophically airtight room from which no fresh breeze of reason can possible enter or exit from. Such people don’t seem to realize that exactly these attitudes created the torture of scientists during the Spanish inquisition, and is the mentality that causes themselves, as well as members of other faiths, to claim exclusive ownership of all that is true, while (for example) those hideous Muslims just want to take over the world by force. When such ideas become unquestionably fixed in the minds of many religious people, as being beyond fault–then there is no way to effectively argue against them–since they see all opposing ideas merely as the devils temptation or the denials made by sinners. When assuming to represent the “one true faith,” each religion becomes further removed form empathy and compassion and inevitably increases the discord in the world–perhaps being the potential source of Armageddon merely because of their own narrow minded dogma, and denial of any truth held by others. Apparently they have a need to perpetuate this kind of delusional thinking while the rest of us can only hope that someday, a crack in the window of knowledge, or a sunbeam of tolerance, will enter their hermetically sealed theological rooms, and restore some degree of open mindedness and genuine understanding! I don’t accept any religiously fundamental people to believe or accept the ideas I have just now expressed, but it is great to finally find a website that stands up for the simple power of reason. Good commentary. I long ago gave up trying to convince people to alter their ironclad beliefs. You mention people latching onto certain biblical passages to support whatever they believe. What’s really sobering is to realize that you can find something in the Bible to support absolutely ANYTHING you choose to believe!